Not many Tabata apps on the market that are free and work as well as this. Would love some new features, though no requests atm. Definitely would love an Apple Watch version of the app! Wish it would use Spotify playlists. This has been a great app to use in my physical education classes. Just wish I could choose playlist from Spotify, not just my iTunes playlists. I’m a Jiu jitsu guy and I have used this app to times my workouts and my sparring sessions. I highly recommend it. Love that I can pick this up any time throughout the day and even involve the kiddos. So simple! Awesome workout trainer, music mix works great. One needs phone, the app and desire to work ones bum off. Portable and no special equipment needed! This app no longer shows total time for entire workout. Previously I could decide if I wanted to do a twenty or 30 minute HIT. Now I no longer know the total duration of my workout. I have to guess. Also it no longer switches to horizontal view. And no matter what I set to include a cool down. It won’t do it. I do like that I can set fast and slow music to two separate playlists for fast and slow tabata’s. I just wish it worked like it used to do. I don’t Tabata without this app...it’s the Best! The only HIIT app you need. I’ve tried others only to return to this one. Great app! But I’m hoping I’ll be able to connect my Spotify account in the future. I entered a playlist to play during my work and prepare Sessions and it only played it during my work and it wasn’t even a playlist...it was one song from the playlist. And it was the start to the same 20 seconds of the beginning of the song each and every time on my Tabatas. The new starting and stopping sounds are annoying. The old version was much better. Why did you change it!!!!?? Great program. It’s very easy to use. I love it!!! Use this all the time. Bought this app for interval training it has a simple interface. However; the lack of an option that would indicating the user of the midpoint of an interval makes this app less useful than others. Often times interval training requires you to switch sides or movements during the prescribed work interval. To be honest a free version of similar Tabata apps have more customization. Looks for another free option before you purchase this. $4 app to keep time?! Whatever. You gotta pay to lead the way. I'm in a 28 day workout group and this Tabata clock is perfect! Workout 1 has seven lower body exercises at 20 seconds each with a 30 sec circuit break. I practiced using the Tabata clock and giving myself 5 sec rest to adjust for next exercise made for smooth transitions without skipping a beat! Thanks! Time in between rest periods. This would be better if I could increase the time of each Tabata and rest periods. Does exactly what I need. Personalized to your work:rest ratio. Great app until now. For some reason on the iPhone X the app locks up. When you start the Tabata it’s smooth but if you end it then try to start it up again too quick it freezes for a few seconds and then starts. On my 6s it never did this. I think the app isn’t up to speed with the new technology of the phones. Fix this please by sending out an update! This is a great app and the developers continue to keep it updated. Been using this app for years!!! The only feedback that I could see improving this is if they added a timer for AMRAP/EMOM. It's not really needed just a personal preference. Just sent an email to be reimbursed for this app. I need something that I can customize more. Example: I want to be able to have 3 Tabatas set up with different cycles and times in each. Tabata 1 4 cycles 45 sec work 15 sec rest Tabata 2 3 cycles 30 sec work 15 sec rest Tabata 3 2 cycles 15 sec work 15 sec rest With 60 recovery between tabatas. Is this possible? From what I can tell, no. If not I want my money back! I know that I don’t use it as intended but this works great for circuits. 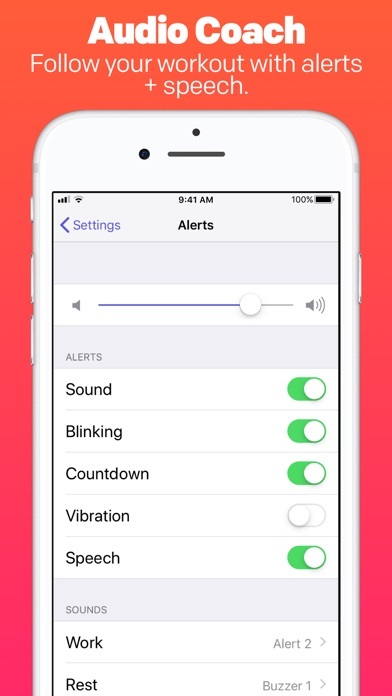 You can have preset timers for different levels and it plays your music in the background. Simple & Effective. Love this app! Keeps me on track and pushes me. Love it, worth the cost. No bugs, works with no issues and have been using for over a year now. I’ve tried a few Tabata Apps but I like this one because of the simple interface and user friendliness. This app has been part of my training regimen for more than 7 years. It has helped me reach my peak with ease! 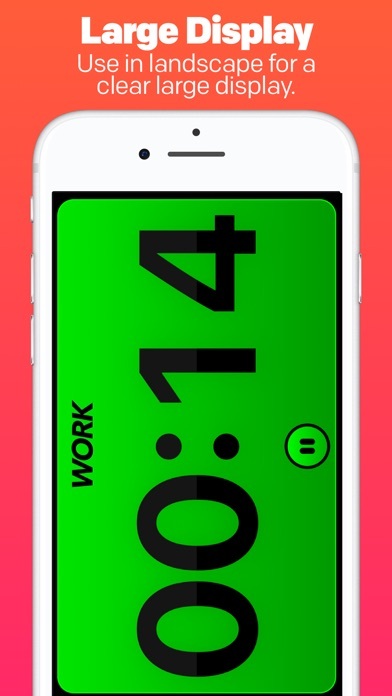 This is by far my favorite timer app for doing HIIT exercises. Simple and easy. Worry about your workout and not your timer. Perfect. I have had this app for a while and use it twice a week- latest release added great new features but crashes all time. I set for 3 Tabatas and each time it stops during recovery period after 1st one and I have to reset. Am running latest iOS on iPhone X. Now just use one Tabata at a time but that is not the point surely. Hoping for a new update to address this. I love this app because it’s easy to use and I can use the music I like in the background. Perfect anywhere you go. I've been looking for something like this for a long time to synchronize my workouts. Tabata pro is perfect. I would definitely buy it again and definitely recommend it to a friend. Combine Tabata training with weights and it is a perfect fat burning routine. Best app for my workouts that I have found. Has always been a 5 Star for me, until now. I recently purchased an Apple Watch which is not supported by the app (yet?). Still the best tabata timer on the market in my opinion, 5th Star is reserced for Apple Watch comparability. I've been using this app for about one year. Really like it for doing short HITT workouts. Very easy to use. I like that it is customizable to all fitness levels. Have used this on and off for years. Works perfectly and flawlessly. Easy to use. Can see it and hear it from across the room, and works while I play music on the same device. Highly recommended. It is invaluable to my training and stretching! Simple. Does exactly what it needs to. No wasting time tweaking and fussing with ‘options’ and ‘features’. Works! Love this! So simple and easy to use. It fits my needs perfectly. This has been an excellent tool for timing my workouts. This allows me to set my timing once without wasting effort resetting each increment. My friend put me onto the concept of Tabatas and I’d have to say I can squeeze in a great HIT workout into my busy day. I’m getting back on track into a fitness routine and glad I have this in my toolbox. Highly recommend to people who already know what sets of exercises they want to do. I use this app in all of my timed exercises. The Austrian Burn is a good one to use this app on. If you’re serious about interval training this is a great app! Been using for almost 6 months and it’s been a great tool for organizing our tabata days. Worth the price. I have used numerous Tabata timers and this one by far does not disappoint!! 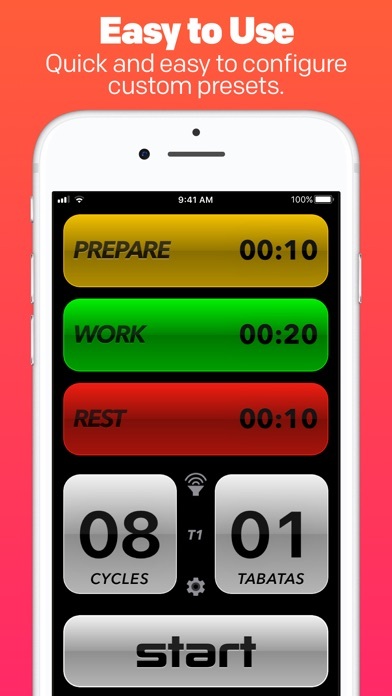 Very user friendly Tabata timer. I love I can use my own music from my library with the app. I’ve used this app for 3-4 years now. The latest update literally fix every issue I’ve ever had with the app (that wasn’t many). Added a recovery period along with the prepare period. After the last cycle instead of saying rest, it says tabata complete, and they added the work siren back. Best app ever. I have lost over 130 pounds, and this app (plus weight training)is every bit responsible for it. It does what it supposed to with no hiccups. I like the timer and all of the customizable options. The DJ needs a lot of work. Even after trying all of the possible variations, it still plays the same song, from the same spot, every cycle. I’ve had to start using two devices. One for timing and one for music. It kinda defeats the purpose of this app and it’s also cumbersome. If I find an app that works better I’m ditching this one. Very easy to use. Able to play my songs while using app. Simplicity at its best. I enjoy group fitness classes but they don’t always fit into my schedule. I use the Tabata Pro App to keep me honest and focused. It offers great flexibility and I cannot miss the buzzer. I really like this app!! I do wish I had more options with music control but otherwise GREAT! I have had this app for many years. I usually like using it but since I too miss the total time when setting the Tabata. Also cannot for the life of me get the Recovery period to start at end of workout. Please fix these items. I've created some excellent workouts for my clients with this app. And I've personally seen great results. I’ve been using this app for 7 years...’nough said. Learn about Tabata and rock out! Great app. Been using it for years. Easy to use. Self explanatory. Nice simple interface. I want ed an app that was very user friendly. This one works great for me. Use for rowing and resistance training. I use this for my abs and push ups workout so that I don't have to look at a clock. So helpful! Like the improved sounds and appreciate that you can turn down just the app volume--not your full phone volume. Love that this plays through my music! Also looks great via airplay on the TV. Highly recommend! I’ve been using this tabata app for years now. It’s great!! I run competitive masters track and field, and as a 60+ sprinter these 3 and 4 cycle, 8 tabata sessions have got me in world class shape without the beat on my legs that intervals on the track would have put me through. I can build strength and get an aerobic workout in at the same time. I almost bought a timer-watch...so glad I didn’t spend the extra money. I use this timer at home for a variety of workouts and it’s perfect! Flexible Help keep my Intensity up while working out! It’s an awesome app. Just set your time and get to work. This app keeps the time for you. Just set it and forget it, lol! I have been using this app for years and recommend it to all my clients to use. Love that you can change the work/rest time and prep time too! I use this to workout every single day and have been for around a year. There's 4 different settings of timers so you can customize it for different workouts. It really is exactly what I was looking for. Very easy to use and continues to work even if you've left the app. It’s awesome! Just wish it linked to pandora for a better music experience. ...and, it was certainly missing before: We don’t need 30 minute+ running. High Intensity with TABATA handles it all. Thanks for a great tool! 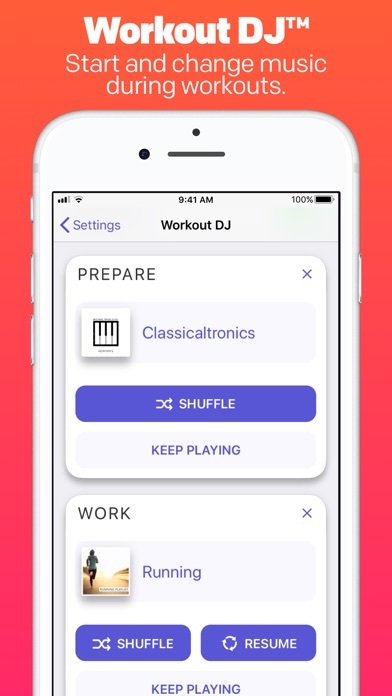 With the last angry updated, the DJ portion of the app is unusable, was what made it better than the others. Just allow the same playlist to play throughout the workout, just play in the background, if you need fancy duck the music when commands are given and return to original level. Return control of original music level.... Then maybe, record to health app!!! I use this app every workout..., Until then I’ll be using another app. Don't waste your money. The upgrade is terrible, and several of the free alternatives are far superior. Among other bugs, the audible "work" command occurs 3 seconds into the work cycle! Also, if you choose the "skip final rest" option, the updated app eliminates the rest period between each tabata in the workout, as opposed to just the final tabata at the end of the overall workout. C'mon developers, how difficult can it be to program a glorified egg timer? Tried them all - BEST Timer! I own a fitness studio and recommend this app and their Boxing Timer to all of my instructors. I use this app for my own workouts as well as with my clients. Easy to use and understand. Doesn’t have the bells and whistles of some others, but really doesn’t need them either. This app has been great for exercise. A group I volunteer with, Youth Impact Racing, has been using the app as a timer for the racing. I have used this app since it first appeared in ITunes!! Love it just used it today!! Love how you can turn the phone sideways and it shows you the total time!! Love it!! Highly recommended!!! I found the Tabata app much easier to use than another free app I had downloaded. Worth the small cost. Different way to use the app. I don’t use the Tabata Pro the way most people do. I was trained by Fred Haan who wrote the book “the slowburn – the fitness revolution“. I was trained to use a metronome but I didn’t find that very helpful but by using the Tabata app working for a count of six or eight and then instead of resting I do the opposite movement either flexion or extension. It’s really great because I don’t have to concentrate on the number of repetitions that I’m doing and so I don’t lose count. At 60yo, my vision isn't what it used to be. I love the structure of the screen - the size of the characters, the colors/color changes and auditory cues. Very simple looking and simple to operate. Looking forward to loading music for the DJ option. I love using this timer!! !